Product Overview The AmpliFi™ MeshPoint HD (High Density) features an adjustable super antenna. 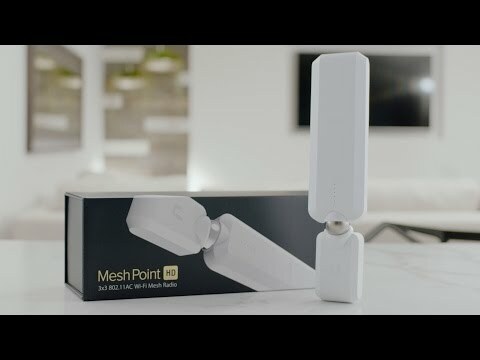 Pair the MeshPoint with the AmpliFi™ Router to expand the coverage of an AmpliFi™ network or turn an existing router into a powerful mesh network. AmpliFi’s app directly links AmpliFi devices to your smartphone via Bluetooth LE. With a simple, intuitive setup, you can manage your new network, monitor ISP speeds, invite guests, and oversee network security. Want the Complete AmpliFi Mesh WiFi Experience? The AmpliFi HD Mesh WiFi System including Router and Two MeshPoints, is also available to buy from SCAN. Features • Superior Performance: Integrated Super Antenna for superior range and speed. • Strong but Subtle: Seamlessly plugs into any outlet: no wires, no fuss. • Significant Signal: Latest 802.11AC Wi-Fi technology, integrated. Ubiquiti AmpliFi MeshPoint HD, 1750Mbps, Dual-Band, a/b/g/n/ac, WiFi Extender - UK Model is rated 5.0 out of 5 by 2. Rated 5 out of 5 by PJ10 from Sorted our wifi out The wifi extender has given us full wifi in our house and garden. Very easy to set up and use. Does the &quot;UK Model&quot; come with a 3 pin plug on the unit itself or an adapter?